As we point out during the show many of the experiments can be carried out at home or even at school. The table below lists some of the activities. There are many more not listed. If you would like further advice on any of the activities please contact us. How is the session organised ? The sessions are designed to last a minimum of 1 hour up to a maximum of an hour and a half depending on the range of demonstrations, how they run, audience participation and questions. A series of demonstrations about the insulating properties of water. Audience participation possible. A series of demonstrations about the power of burning hydrogen and oxygen. Very noisy and some loud bangs can be expected. 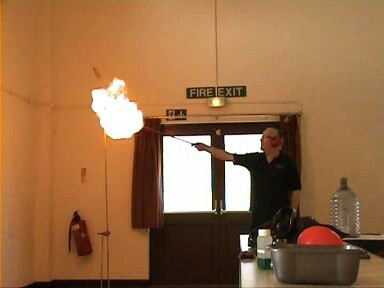 A demonstration on how to make hydrogen and what happens if a plastic egg is filled and then set alight. Noisy and fun. series of demonstrations showing flash paper, flash cotton, flash cannon and "dragon's breath". Using a combination of steam and atmospheric pressure to crush coke cans - and possibly bigger. A very easy way to turn copper coins into silver and gold. Various unusual uses of acetylene gas from creating light to making a small pop-gun. The classic whoosh bottle. How to make a rocket using methylated spirits and a large plastic drinks bottle. Various items are placed in a bell jar which is then evacuated. The effects are then observed. E.g. crisp packet, shaving foam, balloon etc. May include turning water into ice. 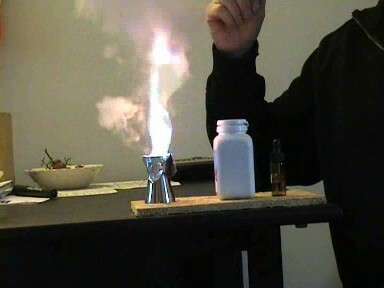 A demonstration showing how mixing of various chemicals can result in ignition without any external application of heat. Group I metals in water if available. Nitrogen tri-iodide if facilities allow it. A range of demonstrations about electric charge and static electricity. Includes a Van de Graff generator. Several versions available from pump-up rocket, compressed air rocket to ethanol or firework with either chip-cone or missile as appropriate. A selection of experiments and demonstrations with lasers including light bending, liquid light pipe and burning laser demo. A variety of demonstrations and practicals showing many aspects of electrical and magnetic phenomenon including motors, generators and some very strange magnetic effects. Splitting water into its component elements using an electric current. The gases can be collected in bubbles and ignited creating a small bang to show that hydrogen and oxygen have indeed been produced. Several methods of creating large volumes of foam some using hydrogen peroxide and some using common household chemicals.